Ian R Clayton, Jan 18 2011. I have lived in Guyana in South America, Europe, Canada, Trinidad, Jamaica and Barbados and have traveled to Hong Kong, Singapore, Indonesia, Malaysia, Thailand, Morocco and Iceland. I am from a mixed background with a very British upbringing in the Island of Trinidad, then at school in Ireland, England and Canada. I live mostly in Canada and Barbados because my business ties me to these places. I travel frequently. I am thus culturally aware, but cultural differences can sometime come as a surprise. One can unintentionally offend, unreasonable take offense and become uneasy for the no apparent reason. I have met travellers who have had bad experiences but I have been blessed with meeting wonderful people who have extended great hospitality. Apart from a slight altercation with angry store vendors in Tangier’s, who blocked my way when I did not purchase their baskets, my adventures have been all positive. On my adventure in Morocco, I was befriended by a brother and sister on the train to Marrakesh. They invited me to their home where I stayed for several days. They were a Muslim family with parents living in a polygamous relation. Discussion were frank and open. We learned a lot from each other in those few days. I visited the poorest townships where people who had not a cent, managed to set aside provisions for tea with a total stranger. Now as I think about traveling alone to a new exotic overseas destination for holiday adventure and a learning experience, I must admit to being a little apprehensive. I like to travel independently as I don’t care for group tours and I am really rather Independent. Perhaps my special partner will come with me but we are both in different settings and it may not work out. In any case a couple will face similar issues of safety and comfort in some areas where they do not know the culture and dangers. Perhaps I have read too many stories like ‘The Accidental Terrorist’ that have made me have more trepidation of the old world. So how do we prepare, what should one do to be safe, what to take, who to contact. Traveling alone into the unknown is not so easy when you don’t know the ropes. Perhaps it is best to contact a well respected travel agent. My friend did that on a recent trip to Peru and was lucky. Some other friends used the same agency and arrived to find no hotel bookings and no tours paid for. They were on their own with thousands of dollars paid to the agent gone up in smoke. I looked at National Geographic adventure travel and would love to do their tour to Antarctica, South Georgia, and the Falklands with Tim Laman, Field biologist and wildlife photographer. I like the trip that cost $34,000US but I do not want to spend that much. I like the Bhutan: Chomo Lhari Trek which is only $4,595 US for 15 days per person, double occupancy not including airfare (add $2500 per person approx). What I do not like is the Group size: 10-16. The same thing happen with Abercrombie & Kent. Great tours; in the range of $7,000 US per person but with groups of 10-20, and you don’t get to choose the group, unless you make it up yourself with your friends. Gap Adventure love changing lives and have a set of core values that focus on small group experiences and a grassroots approach that provides an affordable way to travel. Their Kilimanjaro climbing trip is just under $4,000USD pp. Adventure-travel-destinations.com is now an affiliate of Gap and we are proud to include some of their packages in our line up. I asked some friends for their suggestions on what made an adventure destination and adventure travel work for them. They, like me, prefer solo or private travel with friends. Some had been to Peru, The Galapagos, Argentina, African Safari’s, Walking Tours in Britain, Jungle huts and Iceland Glaciers. All at reasonable cost with direct contacts in the Destination they were traveling to. Just the sort of trips we are planning for our Adventure Holidays. It seems all found local companies that provided advise and planning, personal attention and expert knowledge. it all comes down to recommendations from friends , friends of friends, who you know, contacts and experts you can trust. So our task is clear, we seek out and partner with local operations and invite them to be on Adventure-Travel-Destinations.com. 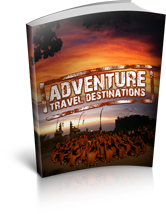 We already have included many excellent resources in our destination guides by region and our vacation guides by holiday adventure themes. Our policy for listing is simple: Companies that list or advertise with us must have a Best Rate Guarantee or a real Special offers for traveler bookings on our site. We will entertain advertisers that we personally invite and accept. We link to great adventure tour companies that have excellent tours, commited people, good insight and fair rates. 2. Mission. A desire to help travelers and make a contribution to cultural exchange and development. 3. Authentic. Must offer an authentic and personal experience. 5. References. All advertisers must provide references or be known to us. Here we list resources that we like and that we think will be useful in planning an adventure holiday to the destination of your choice. For adventure travellers writers and photographers we include resources on how to share experiences and make a few dollars for your efforts. We would love to hear from you to on our blog, mingle section and in comments on this page. Happy Adventures! Bootsnall mission is to cultivate an organic community that encourages independent travel. They organsie unconventional travel like “Weird Asian fruits”. Travel Chat Forum – Share your travel chat advice and your adventure holiday experiences and reviews. Read what others have to say, ask question and chat to people who have been where you want to go. Independent and authentic reviews by Andrew Harper, gentleman traveller who is fed up of infomercial reviews.